Pet obesity continues to be a problem here in the United States. A survey conducted last year by the Association for Pet Obesity Prevention estimates that 52.7% of dogs in the US are either overweight or obese. But what’s more surprising is that 95% of dog owners identified their dogs as being normal weight. Our overweight dogs have an elevated risk of injury, illness and disease so it’s important to take action to help them become healthier by losing those extra pounds. The good news is, the process of helping them doesn’t have to be complicated or difficult. If you want to monitor your dog’s calorie intake by using formulas such as [(pet’s weight in lbs/2.2) x 30] +70 that’s great, but most of us don’t even calculate the calories we consume each day. So, we’re going to keep it simple today with some common sense tips to get you started. First, let’s find out if your dog is overweight. 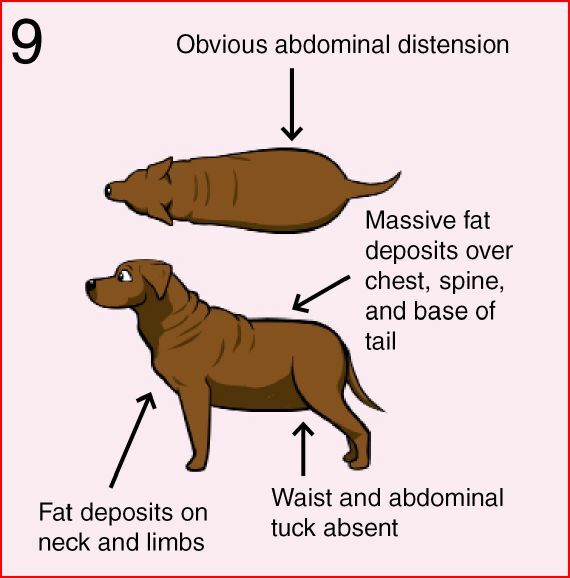 Different breeds of dogs can have very unique body shapes, but for most breeds, these two helpful graphics from Dr. Sophia Yin’s website illustrate what normal and overweight dogs look like. If your dog looks like this first picture, congratulations. You’re doing a super job of managing your pup’s weight! If your dog looks more like the picture below, don’t worry. It’s never too late to get started on helping her lose some of that excess weight, just check out the tips below. Haley’s always been a pretty active girl, but as she got older and slowed down a little bit she began putting on a few extra pounds. Here’s what I did (and continue to do) to help her manage her weight. 1. Feed a high-quality dog food. Since we’re keeping it simple here, I’m not going to get into the weeds about whether kibble, canned, home-cooked or raw food diets are best, but you should avoid cheap dog food brands that are high in corn or other grains and choose brands that have a high meat content (with no by-products). The Dog Food Advisor website is a good resource for checking and comparing different brands of dog food or you can check with your veterinarian for suggestions. Don’t assume the feeding instructions on the packaging of your dog’s food apply to every dog. If your dog is gaining weight and you’re not overfeeding with treats or other food, gradually cut back on the amount of dog food your pup receives each day. Also, as dogs get older and slow down, they tend to gain a few pounds so you may have to cut back slightly on the amount you feed to keep them at a normal weight. 3. Measure your dog’s food. Use a measuring cup to carefully measure each feeding. It’s an easy way to know exactly how much food your dog’s eating at each meal and to make gradual adjustments as needed. Small increases in exercise can make a big difference. Make your daily walk just a bit longer or incorporate more play time into each day. Just like with your dog’s diet, you’ll want to make gradual changes so you don’t overwork your dog, especially if she’s very overweight or out of shape. 5. Weigh your dog regularly. Keep a close eye on your dog’s weight loss as you make changes. The goal should be for your pup to lose about 1% of her body weight per week until she reaches her ideal body weight. Have you ever given your dog a large treat or piece of food and they swallowed it instantly? I really don’t think dogs notice how big a treat is, they’re just happy to get one. Small, low-calorie training treats are perfect for rewards or simply break bigger treats into small pieces. Your dog will be just as satisfied and you’ll be feeding her fewer calories each time. Hey, you’ll be saving money too! 7. Try some healthier treats. Many dog treats found in pet stores are high in calories and carbohydrates but you probably have healthier options sitting in your refrigerator right now. 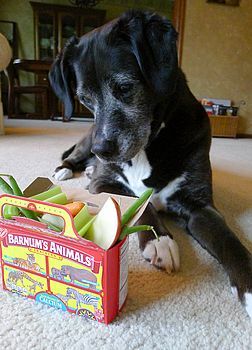 Skip the hot dogs, cheese and peanut butter and see if your dog likes fresh fruits or vegetables. Celery, baby carrots, green beans, broccoli, cucumber slices and apple slices are all great options. Just make sure you’re familiar with foods you shouldn’t feed your dog before feeding any human foods and remember that treats should make up no more than 10% of your dog’s total calorie intake. Using food to motivate or reward a dog works pretty well but we tend to forget that many dogs would be just as happy with a good belly rub or a play session for a reward. Try mixing it up to see if your dog will respond to other things rather than always relying on a food-based reward. 9. Have your dog work for food. Food dispensing balls and puzzles are a good way for your dog to burn off excess energy and calories by working for her food or treats. Most dogs learn quickly how the puzzles or balls work and they enjoy the challenge. If your dog isn’t into these types of toys, she can still earn treats by playing games like Find It or by doing other activities or tricks. Make sure all family members are cooperating with your goal to make your pup healthier. If some members of the family are sneaking bites of food to the dog, all those little bites can add up to a lot of calories. Also, make sure your dog’s not sabotaging her own diet by sneaking food from other sources, like the cat’s food bowl. If your dog’s a beggar, it’s hard to resist “the look”, right? Those pleading eyes that make you think your poor pup will surely starve to death if she doesn’t get some of your BBQ chicken. I don’t mind a begging dog if they lie down beside you and are mannerly and polite about it, but if it’s an issue with your dog, have them settle into their bed or stay in another room until you’re finished with dinner. Another dinnertime habit to avoid is giving your dog a lot of leftovers. I remember my grandmother doing that because she didn’t want the food to go to waste. I’m all for adding healthy human food to Haley’s diet, but I would rather throw away those leftover pizza slices than have them add to her waistline. 12. Manage your dog’s hunger. 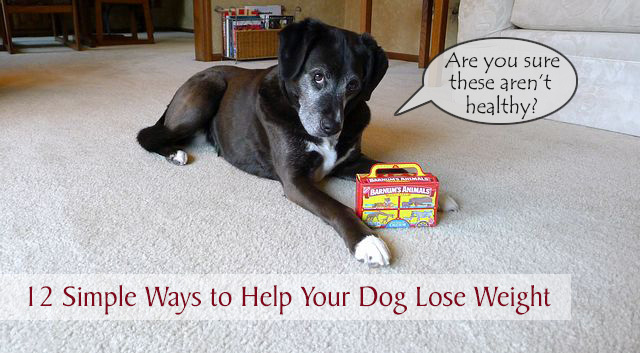 Your dog might be a little hungry while she’s losing weight. If you normally feed once a day, try breaking the meal into two or three feedings throughout the day. You can also set aside a little of your dog’s daily food portion to use in a treat dispensing toy for later in the evening. Canned pumpkin and green beans are common low-calorie fillers for dieting dogs, but your dog will surely appreciate a variety of veggies. If your dog’s looking a little chubby these days, I hope these tips are helpful. I was surprised how much of a difference it made with Haley’s attitude and energy level when she lost just a few pounds. Please note that there are some medical reasons your dog could be gaining weight, so it’s important to talk to your vet if you have any concerns about your dog’s weight or nutritional needs. While working on this post, I kept wondering why so many of our dogs are overweight. Is it mostly driven by the look they give us? Does the look make us feel guilty for not sharing food? What do you think? Share your thoughts and tips on how you help your dog lose weight. Wonderful tips! It’s funny because with one of my huskies, I had to work for months after I adopted him to try and GET the weight on him!!! One of my other huskies I am working at to keep her weight off lol! That’s funny, too bad there was no easy way to transfer the weight, lol! Haley was a skinny girl until she got to be about 4 years old. Until that age, I would just make sure her bowl was always full of food and she would eat whenever she was hungry. I greatly appreciate this information. All points are quite helpful for me and my 3-year-10-month old female Rottweiler, currently weighs 80 lb. Thanks. Yes, I feel very lucky to have my first dog and a Rottweiler; she is my best friend – She is always with me in good time and bad. Excellent tips. We do measure food, but we have to adjust it depending on the dog’s activities. Great point, Linda! Those active working or hunting dogs do require extra food when they’re burning off more calories. Great post. Pet obesity is a big problem, especially in Dachshunds. Chester and Gretel are very fit and I keep them that way with exercise, feeding them reasonably, and keeping an eye on their “figures”. I am planning a big hike with Gretel this summer so I will need to actually calculate her calorie needs to make sure I bring enough for her. I tried the formula you listed but I must be doing it wrong. It said she only needs 85 calories a day! She IS only 11 lbs but 85 calories seems super low. Thanks Jessica, I came up with 220 calories for Gretel being at 11 pounds, but that formula is for dogs that are fairly inactive and Gretel would probably need more since she’ll be out there hiking with you. Don’t take my word for it though, I’m horrible at math and there are too many variables with how active a dog might be for me to calculate calories. I just take note of Haley’s body confirmation. I can see why you would want to calculate the calories when hiking though, especially if you’ll be carrying the food in a backpack. I can’t wait to read more about your trip this summer! These are really practical tips that every pet parent can do to keep their dog fit and trim. Thanks for sharing them. It’s so easy to give into the sad look on a dog’s face when they beg at the dinner table, but if we want them in our lives longer we have to look out for their best interest every day. They can really make you feel guilty with “the look”, can’t they? I figured out that I can still share some bites of food with Haley sometimes, but I just give her tiny bites. I don’t think she knows the difference because she seems just as happy with a tiny amount as a big bite. Great tips! It makes me sad to see an overweight pet since they aren’t likely to live as long. The saboteur… Lol. Yep…. Gotta keep an eye on the hubs! All our girls have known how to work hi for treats!! Thank you! For the first time in 23 years of being an adult and having dogs, I have an overweight dog. My Aussies always keep their trim figures. I leave their food out all day. They go out and run whenever they want to. They only eat when they’re hungry. But this little Brussels mix is a PIG! And he’s the one who gets the good food! And it’s measured! I’m the treat lady, so I really do only give him tiny treats, and not often. Dang it – you’re going to make me exercise, aren’t you? These are such important tips! We have started bringing Bentley’s food to the table so when they ask for a bite of what we are eating, they get a piece of their dog food instead. I also increased his activity and he has lost 11 pounds! What a fantastic (and sneaky) idea, I love it! I’m going to have to try that with Haley to see if I can pull one over on her. Good tips. We usually feed the dogs lots of carrots and I even have some green beans that we feed them. We also use pumpkin to help them feel full and of course they walk twice per day. Excellent tips. I think many dogs are overweight because owners equate food with love…oh, and they don’t like to exercise themselves, so why exercise the dog? Yes, I think you’re right. A lot of dog owners do feel like they’re sharing love when they’re sharing food. That look in the first photo is perfect! Love it! We would say, don’t always feed what the bag says as it is almost always, in our experience, too much. Different breeds, activity levels, ages, all play a role in the correct amount. We use the bag as a guideline and adjust to our own needs. Great post! Good advice to use the feeding instructions as guidelines and adjust from there. I think you’re right about the quantities being too high in general for most dogs. We feed a lot less than the bag guidelines too. Since Rocco’s small, and can’t consume too much without gaining weight. I’ll sometimes use most of his meal for training, and then he gets just a little bit in the bowl. When he was a puppy I did that a lot! He also likes frozen green beans and we cut up our treats as small as possible! I like that idea, Diane. It makes a lot of sense, especially with smaller dogs, to use some of their food as training treats. If you’re doing a lot of training, even those small treats can quickly put extra weight on a little dog. Thanks for sharing your tip! Love the first photo!! Hehe, what a cute face!! Overweight dogs are a real problem nowadays. Mine are both lean. Earl actually has to be fed slightly over the guidelines, as he is classed as a working dog, our vet told us. He lost weight, fed on the average guidelines. He is just so active. Ethel may be the same when she begins her agility. Earl and Ethel always look fit and healthy. I can imagine Earl burns off a lot of energy while training and competing in agility. He’s such a talented dog and I love seeing his agility photos. I jokingly call my house boot camp. Dogs must be in shape. Mr. N usually runs thin and foster pup lost about a pound, I think. He was a little chubby when we got him. Great advice – #2 is a big one for me. When Laika was about 1 she started gaining weight, she didn’t get too heavy but it was really confusing because we were actually more active than when she was a puppy. Anyways I ended up feeding her 25% less than what was recommended and ever since she’s been pretty close to the ideal weight. I won’t be following recommendations blindly anymore. I wonder if the feeding recommendations tend to be on the high side to make sure very active dogs get enough calories or maybe it’s to sell more food. Almost everyone says the same thing, that they have to cut back on the recommended amounts to keep their dogs from gaining too much weight. Wonderful article, Elaine! To be completely honest, I think that most overweight dogs are simply overweight because their owners are too lazy to exercise them and to research healthy doggie nutrition (of course there is the rare exception of a medical problem with the dog, but this is really rare!!). I am familiar with the 52.7% of obese dogs fact, but still cringe every time I read it somewhere. I believe in daily, breed-specific exercise, and take our dogs for daily backpack morning walks. We play a lot throughout the day, and measure out both daily meals (the pups are now on a raw diet). They do enjoy some store-bought treats, but also love their veggies & fruit! Thanks, Barbara! I know, 52.7% seems so high, but then I started thinking about how many dogs I see that are overweight and some are grossly overweight. I’m not surprised though that most people think their dogs look fine even if they are heavy. Even my mom remarked that Haley looked skinny not too long ago even though she was still a few pounds heavier than her ideal weight. If they lose weight would extra skin be an issue? Especially with short legged dogs?